In 2007, after the successful conclusion of the Human Genome Project, the National Institute of Health launched a similar venture, The Human Microbiome Project, to map the human microbiome. It has become one of the most researched medical subjects today. For those of us who have been advocating the therapeutic use of probiotics for years now, we have been well aware of the importance of probiotics and the health of our microbiota to maintain a well-functioning digestive tract. With the scientific research associated with the Human Microbiome Project, finally, allopathic research is catching up. In fact, their recent findings leads to a revolution in the way we understand what probiotics do, how they function and how they contribute to human health. For five years, scientists involved with the Human Microbiome Project have followed two hundred and forty-two healthy people, periodically sampling bacteria from their mouths, nasal passages, skin, and other places, on their bodies as well as in their bodies. Interesting too, is that in 2008, the European Commission and China joined the project, with what is called the Metagenomics of the Human Intestinal Tract Project, also known as MetaHIT. Computers have made it possible for researchers to purify the DNA contained in thousands of samples and to separate bacterial from human genes. This is because scientists now know how to identify human DNA. When they happen to discard it, genes from the microbiome remain. The initial results opened a surprising window to understanding more about the human body, with details like the fact that there are a vast range of microbes that colonize nearly every surface we have. We know that most live in the gut, but many are also found in our mouths. One particular bacterium, Streptococcus mutans, has been found to be the main cause of tooth decay. When you eat sugar, Streptococcus mutans releases acid that corrodes the teeth. How about that! The Journal of Genome Medicine published a review of the microbiome research in 2013. They found the human microbiome to be a very important factor in the life long role of maintaining good health. They found too, that the bacteria in the microbiome are very closely linked to both autoimmune and inflammatory diseases, including IBD. Our microbial world is enormous. One study of a hundred and twenty-four people in Denmark and Spain found at least a thousand different species of gut microbes, although each person carried, on average, only a hundred and sixty species. Now we also know that all animals have biomes. For instance, there is a cat microbiome, a dog microbiome, an alligator microbiome, a dolphin microbiome etc. Scientists in North Carolina State University’s Department of Poultry Science got a grant from the U.S. Department of Agriculture to study the chicken microbiome. Plants also need microbial communities to survive. They found that Rhizobium, a bacterium that lives in nodules on the roots of legumes, helps its hosts carry out a series of chemical steps needed to supply much of the earth’s nitrogen. The Human Microbiome Project has helped scientists identify many species and learn which parts of our bodies they colonize. The human body turns out to be a vast, highly mutable ecosystem. It is becoming clearer that antibiotics are like herbicides for humans. Medically, they are absolutely essential, however, they also change our internal ecosystem in many ways, both big and small, that even a decade ago seemed unimaginable. To continue giving you more information of what was have found out from this major study…..The human microbiome refers to all the microbes that normally live inside the human digestive system. They help the body digest their food, also produce vitamins, prevent digestive tract infections, as well as control the immune system. The research is tells us that a healthy balance of these microbes is very important for maintaining good health. Our unique microbiome is established in the first year of life. The research also tells us that the most important aspect of the health of our microbiome is diversity. When the balance of the microbiome gets upset, for whatever reason it may be, from taking antibiotics, or being under stress or being exposed to an overwhelming number of pathogenic organisms, it results in a compromised digestive function, often referred to as dysbiosis. The one supplement known to help diversity is prebiotics. The prebiotics made from PHGG, partially hydrolyzed guar gum, are the best on market today, with no gastric side effects like inulin and FOS, no taste, no odor…. really easy to take. It needs to be supplemented in higher concentrations than what naturally exists in the gut. Last, but not least, it needs to be an organism that already exists in the gut. When you take a closer look at these requirements, and compare those requirements to the composition, strength and substrate used for the probiotics that we most often use today, most of them fall short of measuring up to what we now know, not from conjecture, but from scientific research, is essential in order to get long lasting, therapeutic results from taking probiotics. Probiotics grown on dairy will not survive in the gut. Nor will probiotics grown on other substrates, like soy, survive. The only probiotic strains that are truly helpful are ones found in nature and also present in the human gut, i.e. human strains. The project showed that most of the probiotics they researched did not survive stomach acid, even though their marketing campaigns said they did. The only strains that do survive are bacillus strains that form their own endospore of protection that pass through the upper digestive tract easily, not affected by stomach acid 100% of the time. Now we also know that we have 20-30 trillion strains of the most abundant strains found in the gut – namely Lactobacillus and Bifidus. We need to be taking more than 20-30 trillion for these to proliferate in the human gut. How can we ever put that many into a powder or capsule? Additionally, in order for these lactobacillus and bifidus strains to be recognized as therapeutic to the gut, they need to be human strain. In the most part, they’re not. They’re grown on dairy, soy or some other substrate. They are not generally speaking, human strain. They don’t promote diversity , they don’t survive in numbers sufficient enough to make a long lasting difference. With that said, I think you can understand why, after all these years of selling probiotics that I thought were proliferating in the gut, I’ve had to change my tune to accommodate all this new information. What I understand now is that the reason the probiotics we use definitely provide benefit, is due to an immune stimulation of sorts that occurs when you take large amounts of these strains, not because they are growing in number. 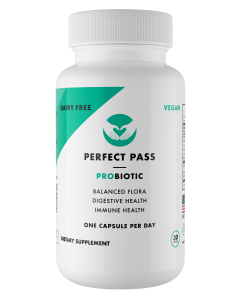 Our Perfect Pass Probiotic is different to the ones I have suggested before. It is comprised of bacillus strains, that are found in nature, that are found in the human gut, that do survive stomach acid 100%of the time and that the number of strains present in each capsule certainly do exceed the number of strains present in the gut. They fulfill all the requirements of a beneficial probiotic composition outlined in the Human Microbiome Project Research.